It’s been a jam-packed week and I’ve found myself at Friday. Grandiose plans for a post continuing the series on clonality (see here and here) did not come to fruition. But, I was saved with a new article that tumbled out of my Twitter feed this morning. 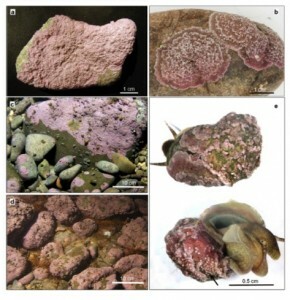 Coralline red algae are important components of marine ecosystems as bio-constructors. They consolidate coral reefs and other coralligenous structures that provide 3-D habitats that favor the development of other benthic organisms (see here). Corallines also significantly contribute to the deposition of carbonate in shallow seas and as such are frequently used as models for understanding the effects of ocean acidification on carbon sequestration (see Brodie et al. 2014 for a review). A truly freshwater (FW) representative has never been reported so far, either as a fossil or as a living species. Like other important marine lineages such as echinoderms, corallines have been considered restricted to marine water, never making the evolutionary step into FW. Žuljević et al. (2016) present the first record of a strictly freshwater coralline found in the Adriatic Sea watershed in Croatia. Despite the direct contact between marine and freshwater environments, the invasion of marine species into freshwater habitats is rare. Even microbes have only infrequently crossed the marine-FW boundary, and most of those transitions occurred long ago in evolutionary time despite large population sizes, high genetic diversity, and a good potential for long-distance dispersal. When P. cetinaensis invaded freshwater, there was likely a vacant niche in terms of uncolonized substratum and the absence of specialized herbivores. The phylogenetic relationship within this genus still needs to be resolved and would be intriguing to follow up on the marine/brackish ancestor to P. cetinaensis. This species could emerge as a new model to study peripatric speciation, but also is of particular interest to understand the ecophysiological mechanism and underlying genetic/genomic architecture that facilitated the transition between marine and freshwater environments. The surprise of finding a coralline alga in a freshwater habitat raises the notion of genetic adaptation across different time scales. This transition and speciation within the genus Pneophyllum likely occurred during the Pleistocene, but there is another marine example of the copepod Eurytemora affinis, that has recently (<200 years) and repeatedly invaded freshwater habitats (e.g. Lee 1999). and the only cave-dwelling chordate species found in Europe Proteus anguinus. many probably [are] yet to be discovered. Brodie et al. (2014) The future of the northeast Atlantic benthic flora in a high CO2 world. Ecology and Evolution 4: 2787–2798. Lee (1999) Rapid and repeated invasions of fresh water by the copepod Eurytemora affinis. Evolution 53: 1423-1434. This entry was posted in adaptation, DNA barcoding, evolution, genomics, haploid-diploid, speciation and tagged adaptation, Algae, freshwater, marine, speciation. Bookmark the permalink.